Do dust mites have natural predators and what eats dust mites? When people learn that they have tiny dust mites that live in their bedding, on their furniture, and are scattered throughout their homes, it is normal for them to be a little concerned about these tiny mites and wonder if there is anything that you can do about them. Because they are so small and prolific, many people wonder if they have natural predators that will take care of the problem. By understanding more about dust mites, where they live, and how to get rid of them, you can learn about their predators and what these tiny creatures are doing in your home. Dust mites are very small bugs that eat skin cells that humans and animals shed. These microscopic bugs are usually harmless. One problem that many people have is when they accidentally confuse bed bugs with dust mites. Bed bugs are a pest that will bite humans and they can quickly infest an entire home. This means that they need to be eradicated as quickly as possible so that they do not cause major problems. On the other hand, dust mites do not bite humans and are not visible to the naked eye the way that bed bugs are. 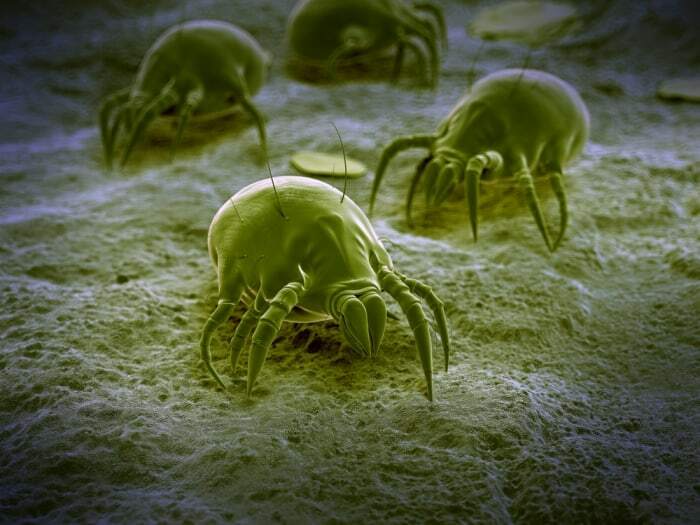 Dust mites thrive in your carpet, on your furniture, and in your mattress. They only eat dead tissues, so they are not parasitic creatures. While you will never experience a bite from a dust mite, there are still a few problems that they may cause, which is why it’s important to be aware of them and to understand the signs and symptoms that you have a problem. Unlike bed bugs, which will bite people, dust mites only eat dead skin. The problem that occurs with dust mites is that their droppings contain a protein that many people are actually allergic to. When people come into contact with their droppings or breathe them in, they can experience an allergic reaction. The type and severity of this reaction will really depend on the person, as well as the amount of exposure that they had, but there are a few signs that you can look for that are fairly indicative of a dust mite allergy. Many people who are allergic to dust mites will have problems when they inhale or dust their waste. The body will release histamines in response to exposure to the waste, which can include irritation and swelling of the upper respiratory passages, as well as nasal congestion. The more severe your reaction is, the more allergic you are to the waste produced by these bugs and the more quickly that you will want to act to rid your home of them as much as possible. Other common symptoms that you may have if you are allergic to dust mites include coughing, awakening frequenting at night, post-nasal drip, sneezing, watering eyes, and runny nose. It’s common for people to experience worse symptoms in the morning when they have just gotten out of bed and for them to improve throughout the day. The problem with dust mites is that they are so small that it is very difficult for predators to find and kill them. For this reason most predators, including spiders will leave them alone. There is one predator that dust mites have, but it doesn’t give people a lot of relief. Common house dust mites are eaten by predator mites, known as Cheyletus. These are slightly larger dust mites that will feed on house dust mites. Many people are uncomfortable with the fact that the only predator that their dust mites have is another mite and the fact that these larger mites are often easily vacuumed up, which allows house dust mites to proliferate. Because you can’t really rely on natural predators to get rid of dust mites in your home for you, you will need to take steps to get rid of the problem on your own. There are a number of products that you can use that promise to tackle your problem and kill the pests. The problem with using these products is that you often have to wait for a few weeks to allow the pests to die or that you will have to allow fumes to penetrate through your entire home. A more natural way to kill dust mites that are in your sheets is to wash them regularly with hot water. While this is a great way to get rid of the dust mites that are on your loose bedding, it will not kill the ones that are in your mattress. In this case you will want to cover your mattress with an anti-allergen cover to keep the population in check. This will create a barrier between your skin flakes and the dust mites, which will reduce their population. Finally, cleaning the air and treating your entire home will help to cut down on the amount of dust mites in your house. Use a vacuum cleaner that has a high quality HEPA filter, use a dust mite eliminator throughout your home, and replace your carpets with hard floors. Running a dehumidifier to remove excess moisture from the air will help to kill them, as they will not be able to survive without a certain amount of humidity in the air. The best thing to do when you are worried that you have dust mites in your home is to educate yourself on these bugs and what you can do to get rid of them. While you can’t rely on natural predators to lower the population of dust mites in your home, there are steps that you can take to get rid of dust mites and enjoy cleaner air that is free of their waste. By understanding dust mites, what they eat, and where they like to live, you can easily tackle this problem at your home and enjoy clean air and a safe place to sleep. What Do Dust Mites Look Like To The Human Eye?